This book provides a selection of common warm up excercises and well known techniques. There is no explanation of important points for any of the techniques - it is a basic description of the way to do each technique. Also, the photographs of the technique suggest that the authors did not know any of the subtleties involved with the technique as both attack and defence appear to be poorly executed. I usually pass this to lower grades to give them an idea of the names of different techniques, but offer them a word of caution about the way the techniques are demonstrated in the book. The technques are wooden and with little sense of dynamic action or appropriate posture - a pair of hippies with little aikido ability. Conclusion - Not worth spending your money on. Pros: aLLOWS AN ABSOLUT BEGINNER TO FUNCTIONALIZE THE DYNAMIC NATURE OF AIKIDO. Cons: Does not offer too deep of revalation advanced students may seek. 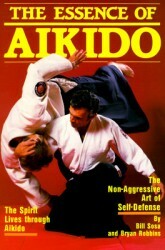 I enjoyed th e publication and use it as a teaching tool for those who would like to begin Aikido, which is exactly what it was intended to be. It also shows very \"practicle \" sides to some complicated ideas.